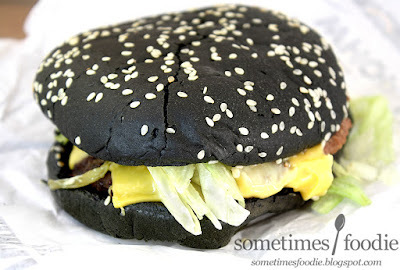 America finally gets some black-themed burger buns! I'm so happy! Like all the other food bloggers out there, I'm super jealous of all of the limited edition burgers available in Japan. They've had red tomato powder burger buns, pink sakura buns, and even all black squid ink buns with black cheese and a black sauce. Our American version isn't that intense, but hey, it's a start! The HA1LOWEEN burger has black buns, but they aren't squid ink-based like the ones sold in Japan. Instead, these are "infused with A1 steak sauce," which is a popular condiment here in the states, but it actually originated in the UK. The sauce alone doesn't create the intense black colored buns. As far as I can tell, this bun is the result of massive amounts of food coloring, but we'll talk a bit more about that later...totally unrelated, but there will be some...trigger warning-type stuff towards the end of this review. 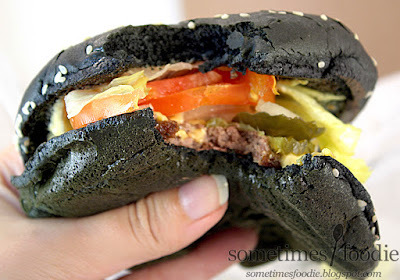 I'll flag it, but be warned: black burger buns come with some...unique side effects. So the wrapping for this fast food burger is freaking adorable and spooky. Look at this cute little mummy! His teeth are all burger condiments and toppings! I love all things Halloween and spoopy spooky, and this? This is freaking precious. I absolutely love it. We have some crayon-like texturing in the black areas, adorable golden eyes, and the type was well placed. This is a pretty tight design and it reminds me of the 90's Halloween buckets you could buy at McDonalds, so it's as spooky as it is nostalgic. Even though it's so simple, it's really well done and thought out. I wouldn't change a thing. When you unwrap the burger, that's when things really get scary. Look at this thing! The black bun is the least scary thing about it. It looks absolutely nothing like the promo picture! 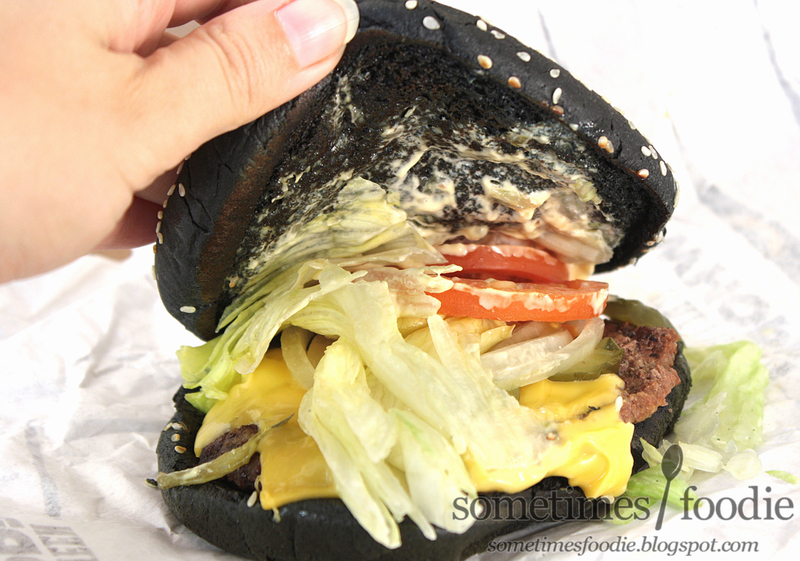 I've got a black bun, which is a little squished, but still pitch black and impressive looking, but the rest of the burger? It looks super sad and pathetic! Look at that lettuce! It's sad, sparse, and practically transparent. Where's the green? Where's the tomatoes? Also, why is my bun way bigger than the meat patty and all the other toppings? This burger ratio is way off! This is a fast food burger, so I knew it wasn't going to be as appealing as the promo, but still, I didn't think it'd look this...sad. Okay, moment of truth! Time to give this thing a taste. I wish I could say this was amazing and night and day different from the classic Whopper...but it wasn't. If I were blindfolded and you gave me this and a normal Whopper and asked me to tell the difference, I doubt I'd be able to. The bun was light and fluffy, and even though it claims to be infused (or baked) with A1 sauce, it tasted no different from the typical burger buns I have had from BK. 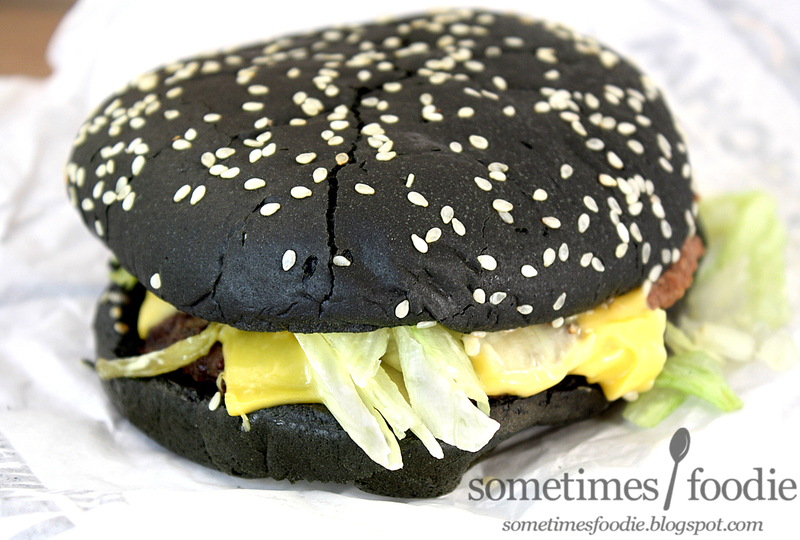 This tasted just like any other fast food burger from Burger King, it just looked goth-y and awesome. Every bite of bun was absolutely pitch black, which was visually impressive, but the taste was ordinary. This was a decent fast food burger, but it tastes just like any other Whopper or BK burger out there. (This thing costs a pretty penny too! You save a lot by buying the meal, but the burger alone is about $5.00!!!) For something so pricey, the taste just isn't that unique. If they had put the A1 sauce on it like they were supposed to, it'd taste slightly different from the normal Whopper, but even then, it's just A1 sauce! The sauce is not what makes this burger appealing and unique, it's the dramatic buns, and they deliver all the impressive dark coloring they said they would and more. Just looking at it makes my gothic-heart all warm and fuzzy. Okay, we're now entering the TRIGGER WARNING part of the review. You have been warned, following this disclaimer is TMI, and...not yummy food talk. So if you are squeamish about icky stuff, or you don't like potty humor, stop reading here and go on with your day. Okay, here we go...so I ate this burger last night during my drive home from Baltimore. I arrived home safe and sound, went to bed, woke up, went to work, and it was an absolutely normal Monday. I just so happened to see Marvo's post on the Impulsive Buy announcing this burger, and it had a few comments. I love seeing what people have to say about food, so I checked them out. Well...judging by the comments...this burger has an unexpected side effect. Not black, not blue, but green. Bright green. We're talking Ninja Turtles. 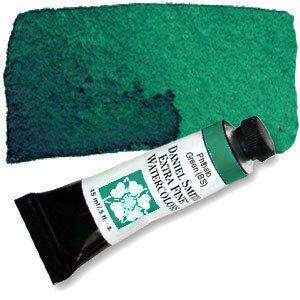 I'm not trying to gross you out, and I don't like talking about this kind of thing, but we're talking Crayola green. It's alarming. Especially if you have no idea that it's going to happen, but it's totally harmless and normal after ingesting a massive amount of food coloring. This is proof that these buns aren't squid ink like what was offered in Japan, this is massive amounts of food dye. (Squid ink does not cause this kind of...reaction.) Your body doesn't absorb food dye, it pretty much..passes through. I guess that means that not only does this burger look cool going in, it's...you know what? I'm not going to finish that sentence. I was trying to put a positive spin on this, but you get the idea. You now know what to expect if you ingest one of these, so no need to panic thinking you've got some kind of new variation of ebola or you're turning into a mutant. I've never commented before but I am DYING at the last section. Absolutely hysterical. Fabulous imagery there. That last thing happened to me after I indulged in some of my son's Minecraft cake that was mostly black icing. I was laughing hysterically when I went to flush but I couldn't bring myself to say the classic redneck line "Y'all come take a look at this before I flush it." 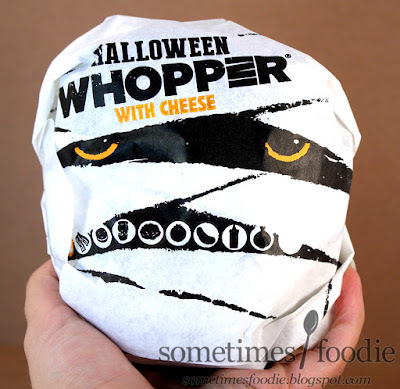 I don't like Burger King's overpriced burgers in the first place...but this blog sure was funny to read! Thanks! Thank you! (I try.) Before this burger I can't remember the last time I ate at Burger King, but I guess that shows that this novelty marketing ploy really worked! I went there and bought it after all. I'm pretty sure I'm going to buy it just to experience the green poop. Blue Moon ice cream eaten in large enough doses had the same effect. Thanks! Thanks for the heads up on the ice cream! That was one I had no idea about. FYI: Eating a lot of typical American black licorice has the same interesting effect, because they rely on dyes to get the black color. I think it's Yellow Dye No. 2 (stop giggling!) that does it. Never had the effect with undyed "natural" licorice, usually from Europe or Australia/New Zealand, apparently the rest of the world isn't as dye-happy as the USA. We do love our saturated colors and a food dye in 'Merica! I've had Skittles and other candies from around the globe and the American ones are always more vibrantly colored. As much as we pick on America and our super processed and dyed foods, I did love the novelty color of this burger. I'm happy I bought it and photographed it, but once was enough for me. It's fun, but it's premium cash for a mediocre fast food burger.